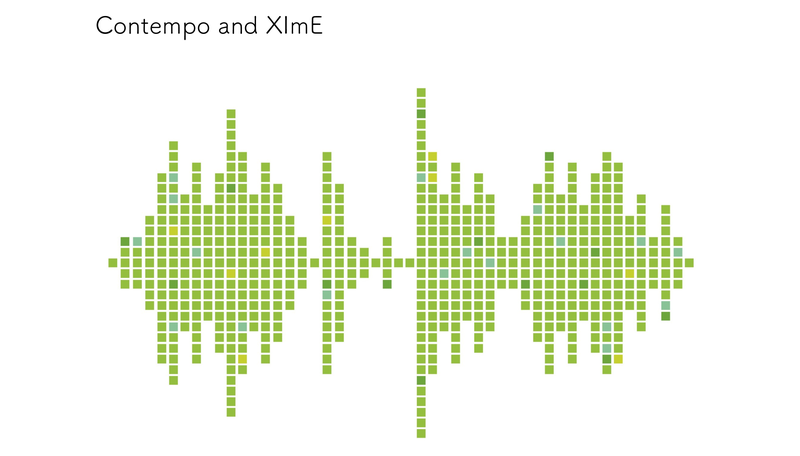 Contempo and XiME, featuring acoustic music, electronic music, improvised music, new instruments – created and composed by undergraduate composers and undergrad/graduate improvisors. Please note the time is 6 PM, not 7:30. 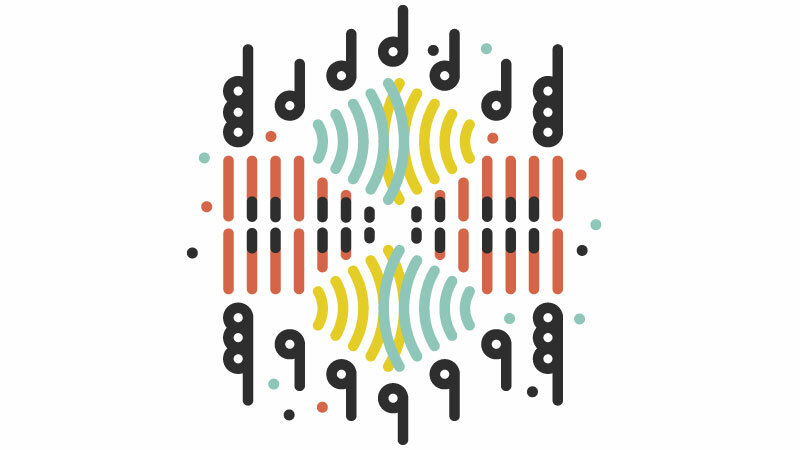 Come enjoy an hour of new electroacoustic music created by student composers from Music 445. And Donuts! New compositions by graduate student composers, featuring Allison Balcetis (saxes) and the Edmonton Saxophone Quartet. Hope to see some of you there! Please forward to interested parties! Please joins us for the end-of-term composers concert featuring undergraduate composers and improvisors. These students have worked hard to create these brand new works. Come out and support them! 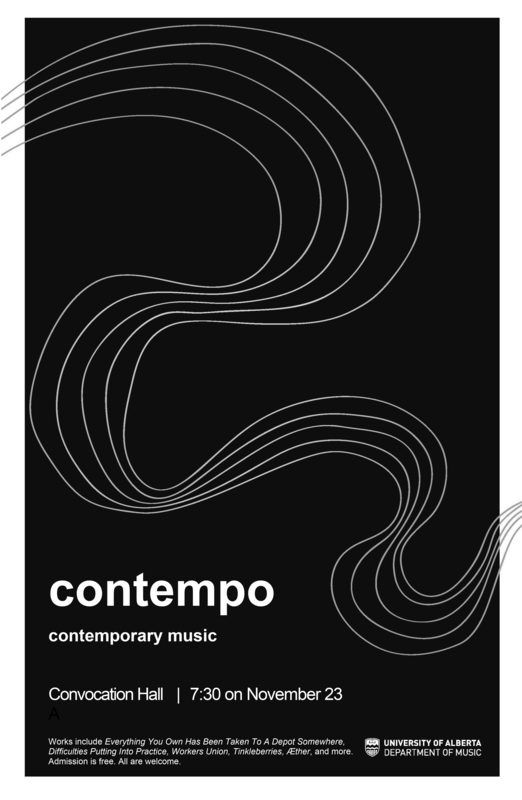 Active since 2000, the Department of Music’s student ensemble “contempo” will be presenting its annual fall concert on Friday, November 23 at 7:30 PM in Convocation Hall. The concert will feature music composed in the last 40 years by international and Canadian composers. All are welcome to listen to a great variety of sounds, shapes, and dramatic gestures. Contempo is co-directed by Roger Admiral and Andriy Talpash. Works include Everything You Own Has Been Taken To A Depot Somewhere, Difficulties Putting Into Practice, Workers Union, Tinkleberries, ÆTher, and more. Welcome back to a new academic cycle! For those who are new here, this site is maintained by the composition area, and represents the latest information about the current year’s activities. Note that the music department pages are still the official location for general music department info, so please make sure you get to know that site as well. Please note: all dates for student concerts and events are listed in the sidebar (which are subject to change). Please check this site often for updates and reminders! Posted in Uncategorized	| Comments Off on Welcome to the 2018-19 academic year! Please join us for an evening of new works for violin + electronics, and string quartet. 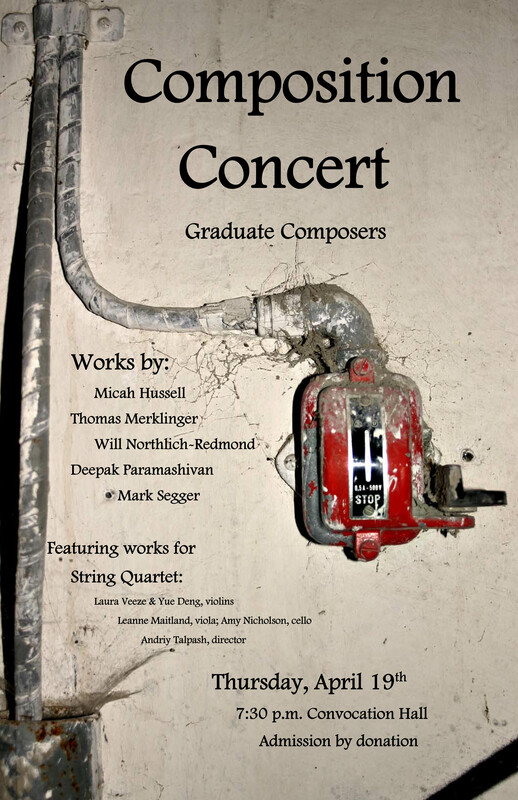 Featuring works by graduate student composers Micah Hussell, Thomas Merklinger, Will Northlich-Redmond, Deepak Paramashivan, and Mark Segger. Performed by Laura Veeze (violin), Yue Deng (violin), Leanne Maitland (viola), and Amy Nicholson (cello), and directed by Andriy Talpash. An eclectic concert hosted collaboratively by XiMe (U of A’s Experimental Improvisation Ensemble), Contempo Ensemble, MUSIC 470/570 Composition and Sonic Arts 2, and MUSIC 260 Composition. Thirteen new works by Undergrad and Graduate composers will be premiered by UofA’s Department of Music ensembles XiMe and Contempo. Also Emily Casavant and Isael Huard will perform their own work, and the unique Will Northlich-Redmond will close the night with a memorable XiMe performance. Join us! 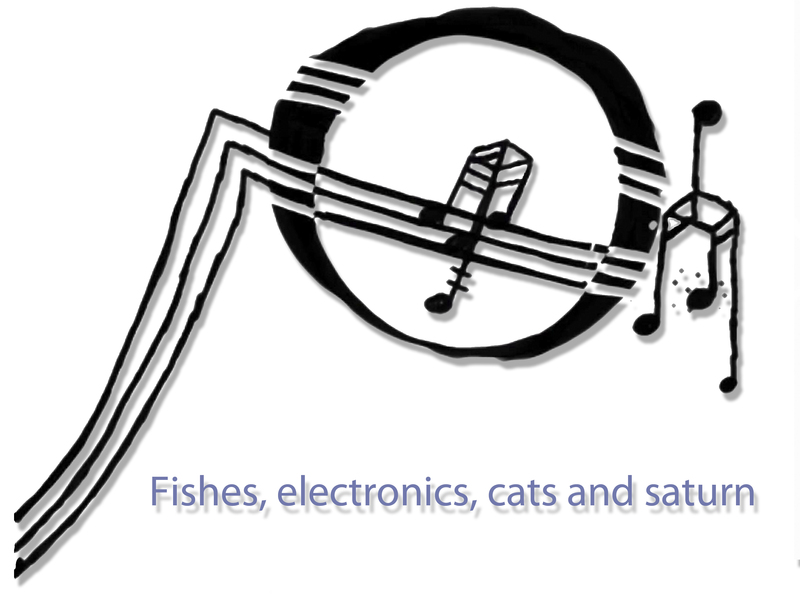 we promise there will be multichannel sound diffusion, fishes, interactive electronics, cats, trios, quartets, new conducting techniques, free improvisation, video scores, and even composers having nightmares with Saturn. 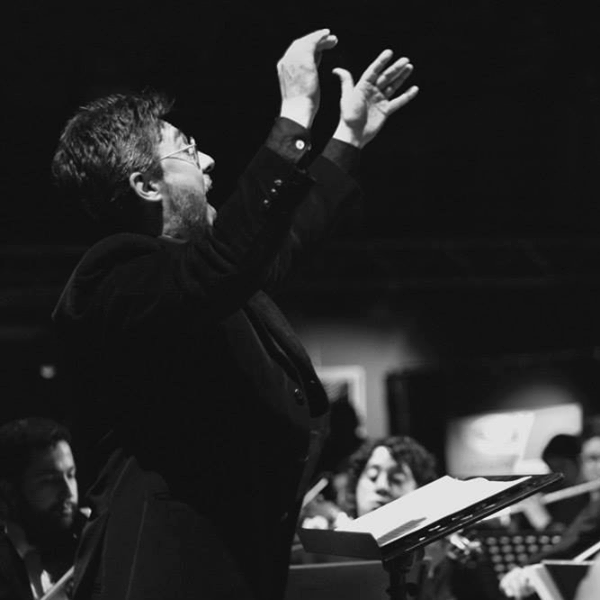 We are very excited to host a talk this Wednesday (March 21) by the renowned Argentinian conductor and composer Miguel Bellusci, who will perform selections from Kagel’s Die Stücke der Windrose as part of New Music Edmonton’s 7th festival of new music (Holy Trinity Church, 7:30 p.m., March 23). The concert also features a work for string quartet and electronics by our own doctoral composition student Nicolás Arnáez, performed by the Vaughan String Quartet. It finishes with the world premiere of a Kagelian musical theatre piece by Bellusci himself. Composer Mauricio Kagel, who was born in Buenos Aires in 1931 and passed away in Cologne in 2008, lived the first 26 of his 77 years in his home city and the next 51 in Germany. In Argentina, Kagel was often considered a German composer, while in Germany, although his name had a prestige that broadly overcame his biographical data, he was frequently associated with his native home of Argentina. Elsewhere he often simply placed in the blurry category of “Latin American” composer. For this talk, entitled “The Argentine in Kagel,” Bellusci will trace the Argentinian elements of his works, an orientation which is essential in understanding his music. Through diverse pieces such as Der Tribun, Mare Nostrum, Die Stücke der Windroseor, Tango alemán, and others, Bellusci will immerse us in Kagel’s unique musical universe, including his formative years in Argentina which shaped his unique and distinctive style. Bellusci will also touch on his own work as it relates to the concert on Friday, March 23, which will be presented as part of Now Hear This!, the 7th New Music Edmonton Festival of New Music. Please join us for an evening of new works by University of Alberta faculty composers. Faculty composers, Howard Bashaw, Mark Hannesson, Scott Smallwood and Andriy Talpash with new works for Guillaume Tardif, Roger Admiral, and the Edmonton Saxophone Quartet. 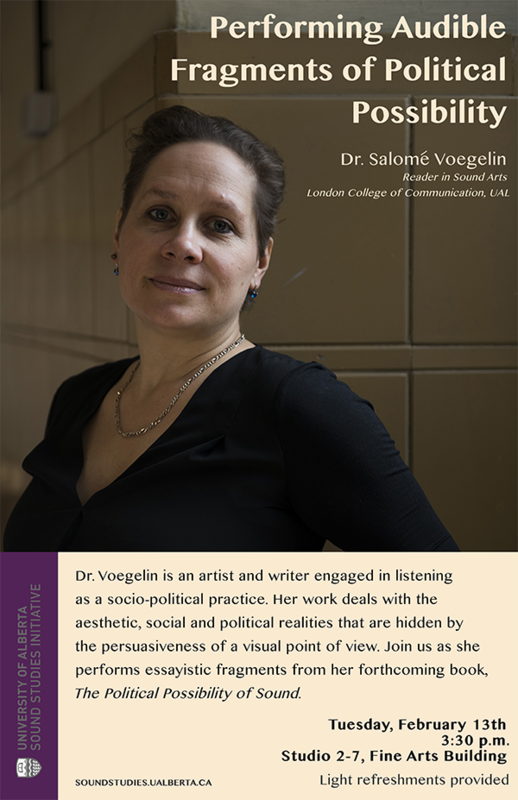 The Sound Studies Initiative pleased to host Dr. Salomé Voegelin. Salomé Voegelin is an artist and writer engaged in listening as a socio-political practice. Her work deals with the aesthetic, social and political realities that are hidden by the persuasiveness of a visual point of view. She is the author of Listening to Noise and Silence: Towards a Philosophy of Sound Art, Bloomsbury 2010, and Sonic Possible Worlds: Hearing the Continuum of Sound, Bloomsbury 2014. Voegelin is a Reader in Sound Arts at the London College of Communication, UAL. When: Tuesday, February 13th at 3:30 p.m. This talk is an attempt at performing rather than presenting the fragments that make up a collection of essays on The Political Possibility of Sound, to be published by Bloomsbury in 2018. An essay is an improvisation, a trial of material that is not necessarily good or complete. Its porous and contingent nature forgives a lack of formality while the absence of good style and the neglect of technological perfection or virtuosity releases the potential for the incomplete and the unrealizable. Through its improvisatory and ‘non-virtuous’ nature it lends itself to performance rather than a lecture: to make unexpected connections and juxtapositions that reveal a different way things could be thought. This performance of essayistic fragments practices rather than articulates between sonic cosmopolitanism and impossible geographies, between the indivisible volume of an auditory world, the speculative reality of the invisible and the audible and inaudible subjectivities that inhabit its sonic depth. It agitates sound’s potential for interdisciplinarity and works across concerns to highlight the sonic in-between: sound is not ‘this’ or ‘that’, but is what things are together and thus it encourages a different thinking about the possibilities of the political.